Over the week of 2nd-8th July, Wales for Peace have been participating in the Llangollen International Eisteddfod - with a small 'pop-up exhibition' complementing the work of the Llangollen Archives Committee to capture the 'Peace Heritage' of this incredible festival of peace and reconciliation, borne out of the ashes of World War 2, that is now celebrating its 71st year. WCIA's contribution to Llangollen's exhibition has focused on exploring the heritage of the Llangollen Youth Peace and Goodwill message, working with the Archives Committee and local partners. We are tremendously honoured to have been invited to present Wales' Peace Heritage story, as the 'Day Presidents Address' for the 4th July. WCIA would like to express our sincere gratitude to our 'Peace Associates' Awel Irene and Sarah Baylis for leading our work with the Llangollen local partners, and to Eisteddfod Chair Terry Waite CBE for their support for this ongoing peace heritage work. View 4 videos about Llangollen's Peace and Goodwill Message (curated by Sarah Baylis and Awel Irene, edited by Llinos Griffin, Gwefus). 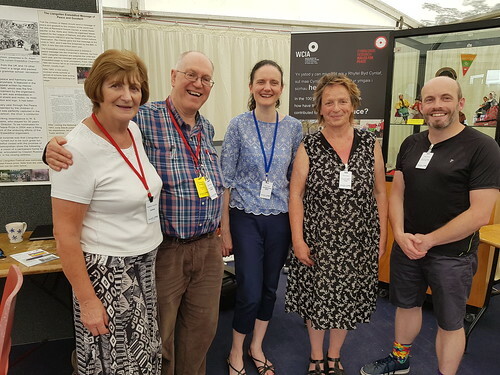 The Archives Tent at the International Eisteddfod hosted an impressive exhibition drawing stories from across the decades from the start of the International Eisteddfod in 1947, to today - along with a Wales for Peace touch screen and pop-up exhibition.